Whether you are searching for a new store location or keeping tabs on a construction project, these two new apps in ArcGIS Marketplace will give you laser-beam focus on your area of interest and just might make you a superhero in your organization. Easily compare sites with GISi SmartSite. Be smart about site selection. Making a poor choice of where to locate can be very costly, whether the site is to be occupied by a commercial business or a nonprofit organization. And once you've selected your site, it's equally important to stay on top of which locations are performing well and which ones are starting to flounder. By using GISi SmartSite, you can project revenue and mitigate risks during the site selection process. You can also anticipate problems at your existing sites and take corrective action before it's too late. The SmartSite app adds a variety of useful geographic and demographic data to your own real estate data and gives you tools to analyze that data. You can easily compare sites, see which ones are performing up to standards, assess drive times for customers you are targeting, and identify locations that are close to the people you want to reach. This AirBus app helps you monitor a site on a regular basis. 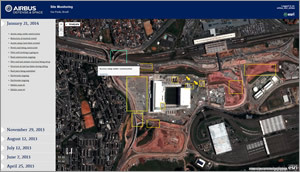 If you need to keep track of a particular location on a regular basis, such as a construction site, oil platform, or deforested area, this app by Airbus will give you a clear idea of what's happening and how things are changing. You can monitor your chosen sites daily, weekly, or monthly. You can even specify the types of changes that you would like to track. The app has two options to choose from: you can select your own area of interest and how often you get information about it, or you can opt for Airbus's preselected site service. This service provides reports about areas where events are happening that will potentially affect thousands of people, such as the Fukushima Daiichi Nuclear Power Plant after the March 2011 earthquake and tsunami, or construction of the Arena de São Paulo in São Paulo, Brazil, in preparation for the 2014 FIFA World Cup.